Joshua Lenon talks about blockchain, cryptocurrencies, and why it's essential for lawyers to know what these technologies are and how they work. Currently, there are at least 900 different kinds of cryptocurrencies being traded on the internet. As they have grown in popularity, it has become clear that cryptocurrencies and blockchain technology will inevitably impact the way law is practiced. In this episode of The Un-Billable Hour, host Christopher Anderson talks to Joshua Lenon about blockchain, cryptocurrencies, and why it is essential for lawyers to know what these technologies are and how they work. They discuss how blockchain can perfect the authentication of digital files and how lawyers can start to accept Bitcoin and other cryptocurrencies as payment. Joshua Lenon is an attorney who currently serves as lawyer-in-residence for Clio, providing legal scholarship and research skills to the cloud-based practice management platform. Special thanks to our sponsors, Answer1, Solo Practice University, and Scorpion. Intro: Managing your law practice can be challenging. Marketing, time management, attracting clients and all the things besides the cases that you need to do that aren’t billable. 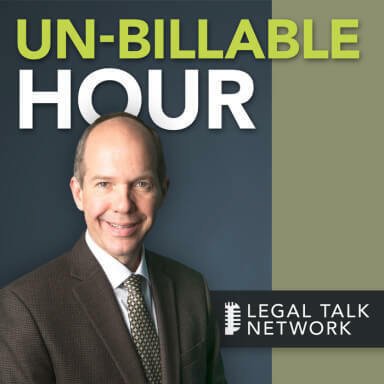 Welcome to this edition of The Un-Billable Hour, the Law Practice Advisory Podcast. This is where you’ll get the information you need from expert guests and host, Christopher Anderson here on Legal Talk Network. Christopher Anderson: Welcome to The Un-Billable Hour, the Law Practice advisory podcast helping attorneys achieve more success. We’re glad you can listen today on the Legal Talk Network. I am your host, Christopher Anderson. I’m an attorney with a singular passion for helping other lawyers be more successful with their law firm business. My teammate had to manage a small law firm and I worked directly with lawyers across the country to help them achieve success as they define it. In The Un-Billable Hour, each month we explore an area important to growing revenues, giving you back more of your time and/or improving your professional satisfaction in one of the key areas of your business. I start with the fundamental premise that a law firm business exists primarily to provide for the financial, personal, and professional needs of you, its owner. In this program, I have a chance to speak to you as I do in presentations across the country about what it takes to build and operate your law firm like the business that it is. I have a chance to introduce you to a new guest each month to talk about how to make that business work for you, instead of the other way around. Before we get started, I do want to say a thank you to our sponsors, Answer1, Solo Practice University, and Scorpion. Answer1 is a leading virtual receptionist and answering services provider for lawyers. You can find out more by giving them a call at 800-answer1, or online at HYPERLINK “http://www.answer1.com” www.answer1.com. Solo Practice University is a great resource for solos no matter how long you’ve been practicing. Make sure you check out HYPERLINK “http://www.solopracticeuniversity.com” solopracticeuniversity.com and learn how to run your practice better. Scorpion crushes the standard for law firm online marketing with proven campaign strategies to get attorneys better cases from the Internet. Partner with Scorpion to get an award-winning website and ROI positive marketing programs today. Visit at HYPERLINK “http://www.scorpionlegal.com/podcast” scorpionlegal.com/podcast. And today’s episode of The Un-Billable Hour is Blockchain. One of the topics that I cover is production and operations in your law firm, and the operations of what this is a second promise of every law firm, right? The law firms does two basic things; they sell legal services and they deliver legal services. And Joshua Lenon has been kind of to join us here today to talk about Blockchain, and Bitcoin, and Cryptocurrencies and how this stuff that most lawyers are willing to bet, haven’t really heard of or at least have no real understanding is about to impact the practice of law and the business of law. So, Joshua, welcome. Joshua Lenon: Hi, it’s great to be here, Chris. I’m Joshua Lenon, the lawyer-in-residence in Clio. Christopher Anderson: Yes, and what is the lawyer-in-residence in Clio do? Joshua Lenon: So, it’s a really unique position. Clio recognized back in 2012 that they needed legal scholarship to help them really understand their audience and to build the best software for lawyers. So, they asked me to join their team and I’ve been working alongside them ever since. Christopher Anderson: Fantastic. All right, so I watched your presentation yesterday on Blockchain and Bitcoin. It was really fascinating because I think, I’m beginning to see what you see which is that this is going to have an impact on the business of law. Joshua Lenon: It definitely is. Christopher Anderson: And that the lawyers need to start understanding at least enough of it that they can take the right actions or hire someone to take the right actions, but not be clueless when this comes down the pike. Joshua Lenon: That’s absolutely the case. I think it’s a technology, and just like any other technology, lawyers need to learn the _______, benefits and risk of that technology as per their ethical duties. But, it’s also a really interesting thing that it can impact their finances as well. And so, I think that should make lawyers doubly interested. Christopher Anderson: Yeah. I knew — I think like the two areas that you talked about yesterday that kind of — it’s really piqued my interest as an attorney who is not practicing right now but how it would impact their businesses, where, first of all obviously, Cryptocurrencies. Joshua Lenon: There are at least 900 known Cryptocurrencies that are being traded right now on the Internet. Christopher Anderson: Wow. And then, the other one which I hadn’t really thought of that Blockchain also enables is the authentication of everything, documents, audio files, videos, it could be or is being used and could be used much more widely to have an ability to really have complete authentication as to a digital file. Joshua Lenon: That’s absolutely the case, and not just a digital file but who accesses that file, who has permissions to access that file, the usage of that file after it’s been released. Pretty much anything that you could kind of write down as a note, can be tracked on a Blockchain in a way that is unalterable, and therefore, a sound authentication method in many instances. Christopher Anderson: And so, what I understood from what you were explaining, I’d like you to talk a little bit about what Blockchain is, but what kind of struck me is Blockchain in a sense isn’t, right? There’s no central Blockchain storage facility, Blockchain is distributed. How does that really work? What is Blockchain? Joshua Lenon: So, Blockchain is really just a software method for storing records, and it can be used to store any type of records of value, which is what’s being recorded is a Cryptocurrency, but it could, as we’ve talked about, be used to store authentication of certain details. Now, how it works is, there is a distributed network and it depends on how the particular Blockchain is set up. But in that network, everybody is processing transactions on the ledger at the same time. And they are basically compressing them and storing them as an address or a hash and then once you get enough of those together they become this block that’s added continuously to this chain of information; so hence, the blockchain. But what’s very interesting about it is, we’ve been operating this model of cloud computing for about the last 15 years where we put all of our information on a server on the other side of the Internet. Joshua Lenon: We know kind of where the server is. With Blockchain, we don’t, because it’s being shared concurrently with hundreds possibly thousands of processors all contributing processing power at the same time. It’s not a new concept but its use especially enabled by software is very, very powerful. Christopher Anderson: And so if someone tries to tamper with a contract, tamper with a photograph, tamper with an audio file or change the content of their Bitcoin then the authentication gets broken in some way? Joshua Lenon: Well, the authentication just doesn’t happen because the processors will take a look at the previous records in the chain leading up to this moment and they’ll see a discontinuity. Joshua Lenon: And so, what will happen is you’ll have a failure to authenticate and the transaction just can’t go forward. So, it’s a way of kind of enforcing trust based on past actions in a way that we’ve never had before. Christopher Anderson: And to your knowledge, is this authentication, this method of enforcing trust, is this being accepted in courts as an authentication method? Joshua Lenon: — with a lot of contracts there. So, there are changes happening right now with the law authenticating Blockchain usage. Christopher Anderson: Really cool. So, we’re going to take a break here for a second and we’ll come right back. We’ll talk about Bitcoin and cryptocurrencies and how they relate to Blockchain? What do they have to do with each other? Advertiser: Ready to create and build your own solo or small firm practice, need a nuts-and-bolts education on the 360-degree experience of starting a business, there is only one online destination dedicated to helping you achieve your goals, Solo Practice University, the only online educational and professional networking community dedicated to lawyers and law students who want to go into practice for themselves; more than 1,000 classes, 58 faculty and mentors. What are you waiting for? Check out HYPERLINK “http://www.solopracticeuniversity.com/”solopracticeuniversity.com today. Is your firm experiencing missed calls, empty voicemail boxes and potential clients you will never hear from again, enter Answer1, Virtual Receptionists. They are more than just an answering service. Answer1 is available 24×7. They can even schedule appointments, respond to e-mails, integrate with Clio, and much more. Answer1 helps make sure your clients have the experience they deserve. Give them a call at 1-800-answer1 or visit them at HYPERLINK “http://www.answer1.com/podcast” answer1.com/podcast for a special offer. Feel like your marketing efforts aren’t getting you the high value cases your firm deserves, for over 15 years Scorpion has helped thousands of law firms just like yours attract new cases and grow their practices. As a Google Premier Partner and winner of Google’s Platform Innovator Award, Scorpion has the right resources and technology to aggressively market your law firm and generate better cases from the Internet. For more information, visit HYPERLINK “http://www.scorpionlegal.com/podcast” scorpionlegal.com/podcast today. Christopher Anderson: And we’re back with Joshua Lenon, the lawyer-in-residence at Clio who had been talking about Blockchain, and what I wanted to do after the break now is talk about Bitcoin as a sort of proxy for all the cryptocurrencies. But let’s just start with what in the heck is a Cryptocurrency? Joshua Lenon: So, a Cryptocurrency is basically translating fiat currency, so, dollars that we have in our pockets into a stored digital value. Now, digital value is not a new thing, right? We’ve got credit card balances, and bank account balances that we access via the Internet, but once it becomes distributed, there’s really nobody backing it up like you have with fiat currency and there’s not the federal treasury for example. Joshua Lenon: Like backing up the US Dollar. So, it becomes a shared value that is almost literally created out of nothing. We’ve just decided that a Cryptocurrency like Bitcoin can hold value, and today it’s worth about $3,000.00 per Bitcoin. Christopher Anderson: Yeah, I guess as with any property in the world, the value is what a reasonable person is willing to sell it for and a reasonable person is willing to buy it for. Christopher Anderson: And right now today, what you’re saying is that on the Internet I can go buy a Bitcoin and the reasonable sellers are willing to sell me one for about $3,300. Joshua Lenon: Yeah, and I think you’ve raised an interesting point that it’s property. So, what we’ve seen legally speaking is both courts and regulatory agencies are trading cryptocurrencies as property, not kind of fiat currency. And so, they operate under a different legal regime. So, the IRSs for example counts cryptocurrencies like Bitcoin as property, and so, therefore, you have to pay taxes on the value earned by possessing a Bitcoin, and just like you are holding a stocks certificate; you have a capital gain stocks. We see the bankruptcy courts are treating it as property. So, they’ll take a look at the valuation growth overtime, like, what was it when you purchased it? What is it now? How does that apply to the estate and the trustees’ valuation of it? And we’re seeing this come more and more into play in kind of personal-legal matters, like marriages where at least one party will have a Bitcoin or maybe attempting to hide marital assets in Bitcoins or in estates where people unfortunately pass on and their descendants now have — or their heirs – their heirs might have to figure out what to do with these digital currencies that are now a part of the estate. Christopher Anderson: — what you can buy or sell on, can go up and down, right? Joshua Lenon: Up and down, absolutely. Christopher Anderson: So it’s a speculative kind of property just like any other, and it’s enabled by this Blockchain, so what you hold is authenticated by the Blockchain technology, is that right? Joshua Lenon: Absolutely right. You can hold any value of Bitcoins that have been created and have been traded for value elsewhere. So, I can have one Bitcoin, I can have a thousand Bitcoins, I can have 1.89 Bitcoins. Joshua Lenon: So the value is really kind of interesting that it can be broken up like that. Christopher Anderson: Can I have pie Bitcoins? Joshua Lenon: I think, technically, yes, but some computer somewhere is screaming in pain right now. Christopher Anderson: — authenticated by Blockchain. Christopher Anderson: — which can affect the value of the dollar in my pocket? Christopher Anderson: Who controls how many Bitcoins are created? Joshua Lenon: So, that depends on the Blockchain but in Bitcoins’ instance, there is an algorithm that guides the creation of Bitcoins. And so, what they are trying to do is create a little bit of artificial scarcity. So, that way, there aren’t too many Bitcoins and we can somewhat estimate the market value of them. And how Bitcoins are created is through a process called mining, where people are processing both the Blockchain transactions as well as an algorithm that was created at the time the Bitcoin and Blockchain was created, and it kind of just finds Bitcoins. And because these people are contributing, computing in resources, they are assigned a Bitcoin that is created every now and then. At the beginning, it was very easy to create a Bitcoin, but now we are seeing scarcity start to happen. Christopher Anderson: Okay, and so, there is no chairman of the Bitcoin fed or anybody else who can like say, oh, I want to go fly to Fiji, so I’m going to print me some Bitcoins. There is no big thing to do that. Joshua Lenon: Absolutely, not, yeah, but that is why we are seeing other cryptocurrencies being created. That scarcity is actually encouraging people to create new and different forms of Cryptocurrency and ways of storing value. Christopher Anderson: Got it. All right, we’re going to take another break here and when we come back, we’re going to talk about what Bitcoins mean to law firms, how is it really going to impact practice of law? Bob Ambrogi: Hi, this is Bob Ambrogi. I’ve been writing, podcasting and speaking about legal technology for over two decades. Monica Bay and I co-host a show called Law Technology Now, where we interview experts behind the newest legal tech. Tune in on iTunes, Stitcher or HYPERLINK “http://www.legaltalknetwork.com” legaltalknetwork.com to learn why technology is improving legal industry for lawyers, their clients and everyone as it brings us closer to access the justice for all. Christopher Anderson: All right, we’re back with Joshua Lenon, the lawyer-in-residence at Clio, and we’re going to wrap up our talk about Blockchain and Bitcoin by getting to the point basically, which is, what do lawyers need to know how is Bitcoin going to really come to impact the practice in business of law? Joshua Lenon: Well, given that there are at least three million Americans possessing Bitcoin right now, the odds are sooner rather than later, you’re going to see Bitcoins coming to your law firm. So, I think the most important aspect for a law firm is to understand that it is mostly treated as property. Joshua Lenon: And so, just like any other property, you can accept to this payment, but we’re starting to see some special guidance come forward from Bar Associations, Regulators on how law firms should handle Bitcoins as payment, and just like any other payment, it can’t be unreasonable for the service provided. Joshua Lenon: So, in guidance from Nebraska, for example, they said, go ahead and take the Bitcoin, but immediately converted back into a fiat currency; turned it back into dollars. Joshua Lenon: You don’t have to go out and sell the chicken. Christopher Anderson: For the chicken, right. Christopher Anderson: — but in Bitcoin they’re saying, convert it. Joshua Lenon: Convert it, yeah, because it is — the value of them are fluctuating quite wildly right now, there’s a little bit of I think a frothy bubble. Joshua Lenon: Excuse my language. So, it could be that it’s in the lawyer’s best interest to convert it right away because then you at least know the value that you’re holding. So, rather than taking a Bitcoin and then the value drops 10%, you lose 10% of your fee, this way you’ve got a fixed amount, and then you can also deposit fiat currencies in your trust account and you can’t do that with a Bitcoin. So, again, it’s another protection method for you. Christopher Anderson: Yeah, so, yeah, because for instance, yeah, because if somebody gives you property you do still have a duty of safe keeping. Christopher Anderson: And I guess if you’re going to be converting it and storing it in dollars and you’re holding it for the client, then you probably need to let them know. Christopher Anderson: Because they are also losing out or gaining, depending on which way the Bitcoin moves. Joshua Lenon: That’s true. Now, importantly, that guidance is only if you’re holding it for the payment of legal fees. Christopher Anderson: Got it. Okay. Joshua Lenon: So, if you’re just holding it in trust, like say it’s an asset in dispute in a divorce, then the guidance we’re seeing is hold it as a Bitcoin or a cryptocurrency, but advice the client that the value still is in fluctuation, and so, just because they’re holding one Bitcoin doesn’t mean they’re holding $3,000. Joshua Lenon: Yeah. And of course, you do have to take the proper steps to keep it secure, and so in this instance, it’s making sure you understand the technology behind it that you’re preventing people from being able to access the Bitcoin and that could be through use of encryption or special software tools, and once you do that, then it’s perfectly reasonable for a law firm to hold Bitcoins in trust. Christopher Anderson: — and you said Nebraska has come out with rules on that. Christopher Anderson: I guess we’re going to be waiting a lot and states are going to be chiming and there is probably going to be differences and we’re going to have to finally have a model rule, I imagine. Joshua Lenon: — and on securing property for our clients. Joshua Lenon: The models already exist. Christopher Anderson: Exactly. You just have to. This is really no different than, like let’s say, a stock — some lawyers do take stock in payment, right? Joshua Lenon: Absolutely right, yes. Christopher Anderson: And that’s very volatile, as well. Christopher Anderson: But we can’t always say, no, when we’re involved in a family law case, we’re involved in a criminal case, we’re involved in a business dispute. Christopher Anderson: And there’s a Bitcoin becomes part of what’s in dispute and we have procedures from what to do with property. We can’t put a Bitcoin in the registry of the court. Christopher Anderson: So, we’re going to have – the lawyers are going to have to know what to do with it. Joshua Lenon: That’s absolutely it, and then there are some simple tools out there called wallet. Joshua Lenon: That will make it easy to securely store Bitcoins and other types of cryptocurrencies, and so, it’s really easy to hop on the web, research wallets. One that we recommended in our talk this week was jaxx.io, which is being produced out of Toronto, Canada and a great lawyer who practices in Bitcoin law up there, Addison Cameron-Huff, highly recommended it to me. Christopher Anderson: Okay. Well, great. That’s a great recommendation for our listeners. And that is where we are out of time and then I could go on with this side. That wraps up this edition of The Un-Billable Hour, for Law Business Advisory Podcast. Our guest today again has been Joshua Lenon, the lawyer-in-residence at Clio. Joshua, if people wanted to know more about this, how might they get in touch with you or do other research, where should they look? Joshua Lenon: So, to get in touch with me, I’m very easy to find. I’m on Twitter at @JoshuaLenon or we can connect on LinkedIn. I’m also working with a group called the Global Legal Blockchain Consortium and this is a non-profit. That’s actually creating a legal-specific Blockchain that law firms, law schools and legal apps can all build and work with together, and that’s a great resource for learning more about how Blockchain is going to be a part of legal ecosystem. Christopher Anderson: And does that particular consortium, is there a website associated with that? Joshua Lenon: Yes, it’s the HYPERLINK “http://www.globallegalblockchainconsortium.org” globallegalblockchainconsortium.org. Joshua Lenon: So, it’s a mouthful. Christopher Anderson: It is, indeed, but I’m sure people will be able to find it. Thanks so much. This is Christopher Anderson. I look forward to seeing you next month with another guest as we learn more about topics that help us build the law firm business that works for you. Remember, you can subscribe to all the editions of this podcast at HYPERLINK “http://www.legaltalknetwork.com” legaltalknetwork.com or on iTunes. Thanks for joining us and we will see you again soon. Thanks for listening to The Un-Billable Hour, the Law Practice Advisory Podcast. Join us again for the next edition, right here with Legal Talk Network. Best practices regarding your marketing, time management, and all the things outside of your client responsibilities. Conrad Saam talks about how lawyers can take full ownership of their firm’s marketing and website. Artificial Intelligence in Small Law Firms — Adversary or Ally? Sarah Schaaf, CEO of Headnote, talks about the key things law firms can learn from tech companies to improve how they operate. Bryan Miles talks about his book “Virtual Culture, The Way We Work Doesn’t Work Anymore, a Manifesto” and the challenges of the traditional workplace. Maddy Martin talks about steps small law firms can take to improve their communication.